As always, I had an excellent experience. The repairs were done quickly and within my budget! They are honest, reasonably priced and do a great job. Their courtesy taxi service is a bonus! - D.L. Always helpful and treat you like more than just a customer. I look forward to doing business with them in the future. - C.S. These guys are honest and trustworthy. This is my go-to mechanic from now on. - K.W. Be sure to print it out or redeem with your mobile phone! FREE State Inspection Drop in only. There are no additional services required. No appointment needed. 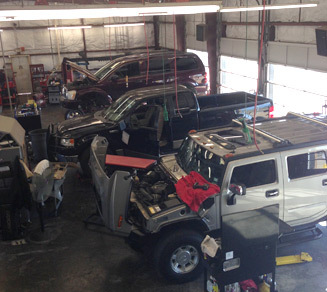 In our waiting room, we can offer you free Wi-Fi access, if you want to wait until your vehicle is being repaired. We can offer you a free rental car if you want to leave your car with us, but you have some work. For our clients we offer courtesy shuttle. You can ask how to take advantage of the service when you make an appointment. Welcome to La Car Porte! La Car Porte is a family owned and operated business. For over 30 years we have served the La Porte community, providing quality car care to help you protect your automotive investment. At La Car Porte, we're a full service automotive care center, providing the best auto repair near you. Our Master Certified ASE technicians use the latest equipment to perform scheduled maintenance and diagnose potential problems. We're proud of our decades of service and commitment to serving your automotive needs. We're the only AAA Approved Facility in our area! Whether your vehicle needs routine maintenance, brake work, A/C work, or fuel system services, our ASE Master Certified technicians and our AAA rating approval assure our commitment to serving you. We also offer 24 hour emergency towing. We also offer free local pickup and delivery of your vehicle. Purchasing a used vehicle? Let our expert technicians perform a thorough inspection on any car or light truck you're considering. You'll get a complete analysis of its condition to assist your buying decision. For your convenience, we perform state emission and safety inspections. We're also the only state approved emission repair facility in the area! Proper functioning of all emission controls is vital to your vehicle's smooth running performance. Our 5 gas exhaust analyzer and master technicians pinpoint and repair any causes of emissions failures. Consult the experts at La Car Porte for your next inspection!